Amorgos (Greek: Αμοργός) is the easternmost island of the Greek Cyclades island group, and the nearest island to the neighboring Dodecanese island group. Along with several neighboring islets, the largest of which is Nikouria Island, it comprises the municipality of Amorgos, which has a land area of 126.346 square kilometres (48.782 square miles), and a population of 1,973 (2011 census). Due to Amorgos’ position opposite the ancient beaches of Ionian towns, such as Militos, Alikarnassos and Ephesos, it became one of the first places from which the Ionians passed through to the Cyclades Islands and onto the Greek mainland. The existence of three independent cities, preserved to this day, with autonomous constitution and the same currency, the size and artistic works of the walls surrounding the city of Arkesini, the ancient towers whose remains are scattered all over the island, the ancient tombs, the stone tools, the inscriptions, the vases and other antiquities are all powerful proof of the size of Amorgos’ ancient civilization. 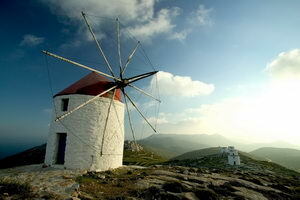 Amorgos is also known as Yperia, Patagy, or Platagy, Pagali, Psichia and Karkisia. Part of the island is named Aspis, where the ancient temple of the goddess Aphrodite stood. Due to the name Minoa we suspect that Amorgos had been colonised by the Cretans from ancient times, but there are no archeological remains supporting this view. In approximately 630 BC, the poet Semonides led the foundation of a Samian colony on Amorgos. With the passing of time, the island’s name changed to Amolgon, Amourgon, Amorgian, and Amourgian. After the 5th century one can also find the name Amoulgos from Bishop Theodore who signed a Synod in Constantinople, as Theodore the Bishop of Parion, Sifnion, and Amoulgion. Skilax mentions it as Tripoli (the circumnavigation of the Cyclades Islands). It was known as “Yamurgi” during Ottoman rule between 1566-1829. The names of the three cities given by Stefanos Vizantios are Arkesini, Minoa, Aigiali or Melania which, according to inscriptions, are the most correct. The three towns are on the island’s west coast because that is where bays and natural ports that could provide the proper positioning for seaside towns and forts exist. Aigiali was on the north East Side of the island close to the present day locations of Tholaria and Stroumvos and to this day can still be found there. Minoa is situated at the center of the northern side near the present day village of Katapola and Arkesini close to the present day lowland location Castri. Excavations and findings, especially burial tombs, prove the intense presence of Amorgos during the prehistoric years, particularly during the first period of Cycladic civilisation (3200 to 2000 BC). The island was featured in Luc Besson’s film The Big Blue. Agia Anna and the monastery of Panagia Hozoviotissa can be seen in the film. The island was also featured in Giorgos Kordelas’s film Ariadni of 2002. The monastery of “Panagia Hozoviotissa”. The spectacular monastery of Panagia Hozoviotissa is situated on the cliff side, northeast of Chora. It was built early in the second millennium in order to protect a religious icon, dating from the year 812, from intruders. The icon is on public display inside the monastery. Opening time for visitors every day from 8:00 a.m. to 1:00 p.m and 5:00 p.m. to 7:00 p.m. Visitors have to be dressed decently in order to enter. Men have to wear long trousers and women a skirt or some long pants and covered arms. As of July 2012, the monastery is active and houses three practising monks. Amorgos: for the majority of tourists visiting Greece, it is the island in the Aegean sea, where Luc Besson created the cinematic success "the Big Blue". The world famous "Panagia Xozoviotissa" monastery and the shipwreck in Kato Meria are only a glimpse of the island's treasures. With our bus routes, you'll be sure to discover the gamut of beauty..